The third in the author’s three part series about his all-consuming obsession with locating and purchasing at any cost Russian River Brewing Company’s Pliny the Elder beer. Driving home with my big game prize — six bottles of Pliny the Elder — I began contemplating the grand ordeal that had been my barely one-month relationship with the beer. A few days before, I’d called my favorite wine store, which was listed on the Russian River Brewing Company’s distribution list, but where I’d never actually seen Pliny before. I asked the gentleman if they carried Pliny. I thanked him and added an “alert” to my calendar to remind me to call. The next day, Tuesday, at approximately 1:42 p.m., I called. A friendly woman answered. “Did you guys get any Pliny the Elder beer delivered today?” I asked, trying to sound casual. “Is there a limit?” I said. 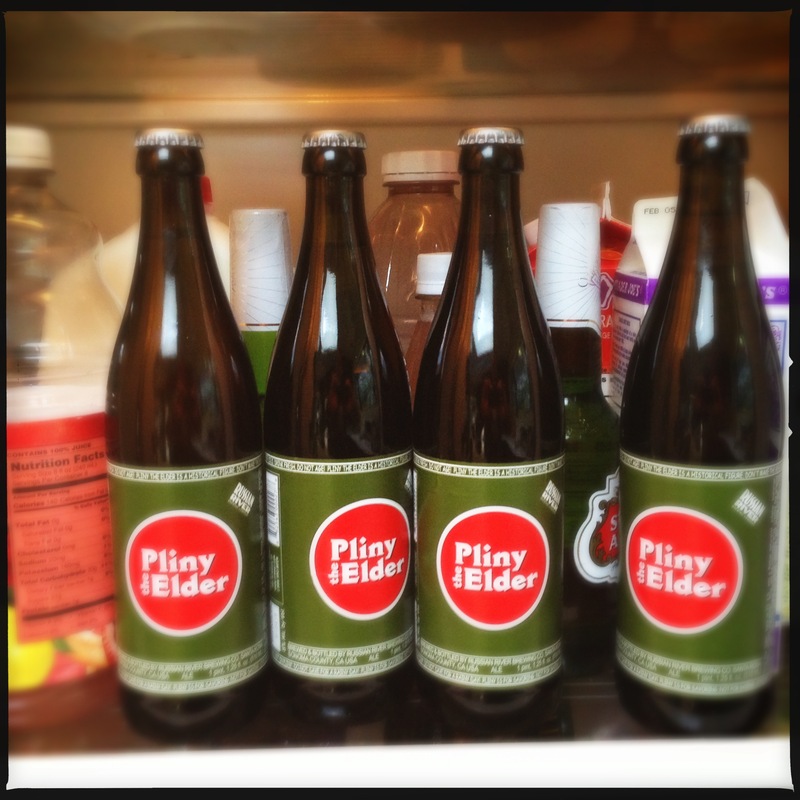 Two full cases of Pliny the Elder — 24 pints — and I could have them all. Or I could be altruistic to my fellow Pliny seekers, and only buy a couple. I clearly hadn’t worked through the moral implications of someone actually one day having as much Pliny available as I wanted to buy. I took a middle path, and told her I’d take six bottles. The next day I rolled into said-wine-shop (and by the way, I’m not telling you the name of it because I don’t want you going there and buying all the Pliny — you need to do your own due diligence!) on top of the world. “It’s amazing what they’ve done,” said the guy behind the counter as he processed my order. “You mean creating such a mystique about it?” I replied. Driving home, I thought about the six bottles in the passenger seat next to me. I looked at them at every red light. Maybe I should’ve gotten a case, I said to myself, and then: I’m so dumb, why didn’t I get a case!?? Why didn’t I get BOTH cases?? Then I felt guilty for thinking that, followed by feeling angry that I was feeling guilty for thinking that. I had cracked the code of Pliny procurement, and not only did I feel curiously unsatisfied — it was undermining my very sense of self. It was as if I was locked in an internal arm-wrestling match with myself — my joy and pride at having finally bagged more than a single bottle of Pliny tangling with my shame and embarrassment at what it was bringing out in me, and the lengths I’d gone to get it. This was now more than two weeks ago, and I have drank one Pliny. I open the fridge, there they are. I move them aside to get to the other beers — the Sierra Nevada or Stella Artois. These aren’t every day beers, I tell myself. I will save them for special moments. But those special moments never seem to come. Or rather, the ordinary moments wind up being the special ones, and I am sharing them with my Sierra Nevada or Stella Artois. And the Pliny remains, for now, undrunk. What, then, does all these mean for my complicated relationship with Pliny the Elder? Probably not as much as I might think. I will drink the five Pliny I have left, and marvel at their deliciousness. I will buy them when I find them. But I will no longer obsess about them. The thrill of the hunt is gone. Lines around the block up here when they ‘released’ the latest Pliny a few weeks ago. Now that’s marketing! So I guess this is where THE HUNT FOR PLINY THE *YOUNGER* begins? Indeed! If fresh hop double IPA is good, think how good fresh hop triple IPA must be!! A fellow Plinian sent me a link to the four places in Southern California that would be having it. I think I might just need to plan a road trip up to the brewery. For the sake of Mother Mary and her son Joking Jaysus boy-O just buy the entire 2 cases next time and forsake the angst and rigor of guilt. Then you may appease your moral center by sharing & enjoying your Pliny bounty with others. I’ll bet more Pliny will be drifting your way from your new Pliny disciples which you don’t have now due to your conscience diligence and the purchase of moral ground that only exists if you wish it to exist (and the ground where currently exists only 6 bottles). Pliny is the Empty Grail from another realm a million miles from me, So if you can’t forsake the moral high ground for your own sake, then do it for my sake and the ‘Oh so many others’ who will go to their graves never imbibing a Pliny until St Peter cracks two bottles at the pearly gates for the newly, dearly and beastly deceased and the smiling jokester son waiting to accept that lucky soul into his lovin’ arms knowing the devil hasn’t even heard the news of the passing ! Can there really be a heaven without a Pliny. I dare say “No”. I hope next time I pop by we have at least a couple of Plinys in the fridge. Gadzooks! Mate, you’ve been possessed by the ghost of James Joyce mated with a drunken Dylan Thomas, from the sounds of yer rantings!!! Indeed, there will be Pliny and more Pliny when thy feets doest next grace my doorjam. That last guy was getting on to you. The problem is you’re too Irish. Only and Irishman [ and maybe a Jewish man although they don’t tend to worship the spirits] could get into a moral dilemma over beer. Lard knows I’m not getting on to him Andrea. Just playing off Irish “guilty pleasures” a little with me buddy. If an Irishman doesn’t feel a little guilty then some of the pleasure is diminished. Gotta have a reason to drop a tear or two into your beer. Can ye ever be “too Oyrish”!?? your dedication to good beer is an inspiration!